Crew size is limited to eight participants. I expect all three expeditions to fill this year. You can choose between the three trips: Feb 8-15, Feb 18-25, Feb 28-March 6. These trips are fully insured and licensed by the National Park Service. Be warned an expedition with me is not a typical “guided trip”. We will make group decisions together and share in camp chores. We take a Minnesota approach, we don’t “float”, we paddle, and we don’t bring tables, coolers of beer and all the comforts of home. We embrace not barricade ourselves from wild nature. This journey is an expedition not a vacation. Shuttles, permits, pvt access fees, deluxe tents, wholesome meals, comfortable canoes and all group gear is all included in the fee. Participants need only bring sleeping bags, personal gear and clothing. For almost a half-decade my crews have universally loved this journey. The complete fee for these expeditions is $2,900 person. No added taxes or anything, I hate that when I go on a guided trip. The fee is a bargain and people have shared that it would be hard to match this fee on a self-guided Lower Canyon attempt. Don’t confuse this expedition with Big Bend tourists’ trips or even Lower Canyon outfitted trips, those are nothing like mine. I limit the size of these crews to a maximum of eight, because small groups move faster and have a lighter impact on the land. I know the river and we paddle the entire stretch of the Lower Canyons. 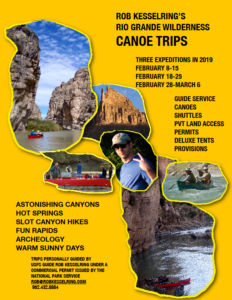 Join me this February on my 20th trip down the Rio Grande. I may not paddle this magnificent river again. My advice, Join me this February. In 2016 four Rio Grande Uncommon Seminars Crews experienced terrific journeys down the Rio Grande’s Lower Canyons. The weather was absolutely spectacular. Cobalt blue skies warm days cool (a few cold) nights. Great campfires. stargazing the zodiacal cloud for some groups, a brilliant full moon for another. A gamut of wildlife, including some of the best views ever of desert bighorn sheep, desert mule deer, javelinas, wild burros and of course the corriente. Some good birds including a Black Hawk and an amazing kettle of over 90 Turkey Vultures. The water was low all season which was contrary to the El Nino forecast, but we always had enough water. The low water did provide some new lining opportunities. We lined the big drop at Hot Springs rapids for the first time. I think many of the paddlers learned how fun technical lining can be and that opened a new dimension in their paddling world. A couple boats also ran San Francisco Rapid for the first time. Several members of crews hiked to the top of El Burro for a singular view of the river and canyon walls. There was swimming, hot tubbing, slot canyon hiking, Farkle, storytelling, desert flowers, historical and ancient artifacts — all of which contributed to extraordinary expeditions. My heartfelt congratulations to all the crews for their positive, cooperative and joyous efforts. That was the real key to the success of 2016.